The Yoga In Schools program offers professional development and wellness training for teachers in the Woodland Hills School District by teaching yoga and mindfulness tools for teachers to use on their own, and with children in the classroom. YIS received a generous $100,000 grant from the Heinz Foundation for this progressive program, and is currently entering the ninth month in a two-year program with the district. The primary focus is on teacher wellness, and on helping to change the behavioral climate of the district. When first presented with the idea of yoga training, many PE teachers were understandably skeptical. The image of yoga being “exotic” or only for extremely athletic types who can shape themselves into pretzels is one that has unfortunately been promoted by many ads and magazines in this country. However, when I walked into the teacher training for WHSD teachers last August as a new assistant to the program, I got a very different impression indeed. Teachers and behavioral specialists of all ages, men and women, at varying levels of fitness, were smiling and laughing as they joined together in learning simple and fun relaxation and breath exercises to be used for their own wellness, as well as that of their students. Exercises ranged from teachers working in small groups to practice teaching each other simple poses pictured on colorful "Yoga Pretzel Cards" to working as teams building sculptures with words affixed to yoga blocks that showed a growing understanding of and appreciation for what yoga could bring to their students and classrooms. Words such as "flexibility," "openness," "trust," "peace," and "working together" appeared throughout each team’s creation. One reason that this training program is so down-to-earth is because of the relaxed, friendly approach used by Joanne Spence, the founder and Executive Director of Yoga In Schools, and a former social worker turned yoga teacher, as well as by the other trained YIS facilitators. Spence's friendly and direct approach and warm Australian accent seem to put people at ease right away. Her mission and talents seem to be rescuing yoga from the realm of an elusive practice and bringing it back down to earth to be used by everyday men, women, and children in everyday settings and situations. She is able to strip away the "mystique" surrounding yoga and break the practice down to its most basic and vital elements: honoring the body and connecting movement with the breath. Spence's prior experience as a social worker and her current work using yoga for healing in schools, hospitals, and detention centers as well as at her private yoga studio all contribute to her ease and skill in working with diverse groups of students, teachers, and professionals. Yoga In Schools’ mission is to empower students and teachers with yoga-inspired exercises to promote lifetime wellness. Their vision is to make yoga available in all schools so that students and teachers develop body-mind awareness and the ability to nurture their own well-being. In 2005, their first year of programming, they reached 300 students and 48 teachers. Since then, eight professional staff and ten volunteers for Yoga In Schools have introduced approximately 18,000 K-12 students to yoga programs and 1000 teachers to varying levels of Tools for Teachers trainings and Yoga Ed curriculum. 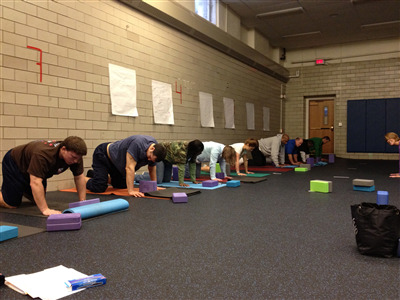 Yoga In Schools trains PE teachers in standards-based, Yoga Ed inspired curriculum integrated into Physical Education in Pittsburgh schools; instructs sustainable health and wellness to at-risk, multilingual youth in after-school and summer-school programs as well as in restricted settings; supports teachers in learning self-wellness techniques and tools for engaging, focusing, relaxing, and energizing students in their classroom; utilizes brain-based learning methods; and provides coaching and training for schools and school districts across the country in sustainable wellness programming. So, the next time you hear someone say, "Yoga's not my thing," you'll know they probably haven't met Joanne or been a part of the Yoga In Schools program yet. This is Patrick Donley’s fifth year teaching at Woodland Hills. For most of his career, he taught in the Jr. and Sr. High. This is Patrick’s first year teaching in the Elementary Schools. Patrick is a traveling PE teacher, meaning he teaches in three different schools over the course of the week. One of the inherent challenges as a traveling teacher is establishing authority, relationships and routine with the children in each of the schools. The Yoga in Schools training program is also new for Patrick. As an athlete, runner and gym participant, Patrick has been exposed to yoga, but didn’t have a consistent yoga practice. Patrick’s initial concerns at the beginning of the year were about how to make the yoga “fun and appealing” for students. As I visited Patrick’s classes, I watched him slowly progress in establishing his classroom rhythms and routines. Patrick added the yoga to his warm-up routine. He integrated poses and breath exercises into his usual warm-up and stretches. Each month he added new poses and breaths. He would demonstrate and ask students to follow him. In the beginning, the yoga seemed thrown into the warm-ups, but over the course of the year, Patrick has really caught on to the “why” of teaching yoga to students. He has learned to lead the students through an experience of practicing yoga rather than just doing this pose and that breath. He has figured out that when students focus on their breathing, move slowly and quietly with calming music, it sets the tone for a focused and calm classroom. At the end of warm-ups, students are sitting quietly, ready for instructions for whatever game or activity comes next. It is a warm April Friday afternoon at Dickson Elementary School. Enter Patrick’s 4th grade gym class – scattered, loud, distracted and itchy to go home for the weekend. Patrick starts the calm music, calls them to their designated spots in the gym, invites them to lie down and relax for a few minutes. They plop down, settle slowly while Patrick talks to them about their breath, taking a moment to relax and be calm and ready for gym. Then he calls them out of relaxation and asks them to follow him as he leads them through Mountain, Warrior 2, triangle, plank, dolphin, fish and lying twist, interspersing fun references to imagining themselves on the beach or swimming in an ocean. He ends asking them to sit up straight and practice bumblebee breath. The room is quiet except for the soft music and the gentle humming of the class, and for just a few magical seconds…the room is silent. Veteran High School Teacher, Mr. Carl Lewis, leads some students in a yoga break. This video is a demonstration using Jill Miller's Yoga Tune-up Balls with teen girls at the Rankin Promise Program. Teacher is Joanne Spence. Yoga in Schools intern, David Ohm, teaching a sun salute to Rankin Promise students.